Gayatri Chakravorty Spivak, Saldivar explores questions of the subaltern and the coloniality of power, emphasizing their location within postcolonial studies. Analyzing the work of Jose Marti, Sandra Cisneros, Toni Morrison, Arundhati Roy, and many other writers, he addresses concerns such as the “unspeakable” in subalternized African American, U.S. Latino and Latina, Cuban, and South Asian literature; the rhetorical form of postcolonial narratives; and constructions of subalternized identities. 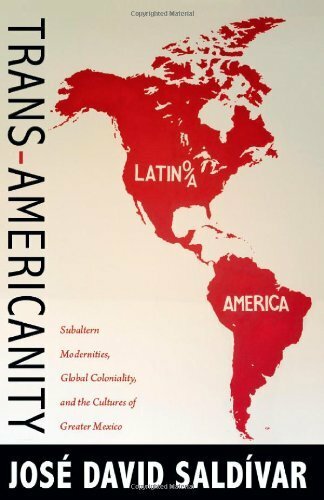 In Trans-Americanity, Saldivar demonstrates and makes the case for Americanist critique based on a globalized study of the Americas.